Oyannews: The development of centralised nations through history has both common and specific features. The centralized states of France and Russia were created (in the 15th and 16th centuries) around Paris and Moscow respectively. Victory for the North in the Civil War of 1861-1865 saved the USA from division. Germany and Italy were centralized by war (1871). To fit the question of a unitary Azerbaijan into these classic models could create a caricature. Actually it would be true to speak about a specific Azerbaijani model. At a certain historical period the lands to the north and south of the Araz River were unified as a natural geographical space under the name Azerbaijan. Political unification was more problematic when compared with the natural, geographical unification. During the rule of the Sassanids (3rd-6th centuries) and the Arab Caliphate (6th-9th centuries) both North and South Azerbaijan were included into the structure of the same state. The Azerbaijan Sajis state (879-941), established after the collapse of the Arab Caliphate, succeeded in unifying the country politically. This set the pattern for ensuing periods. During rule of the Atabeys state (1136-1225) all Azerbaijan lands were united under its rule. Abiding by the natural and geographical unity, the trends towards political unification were continued during Mongol rule (13th-14th centuries) and the Azerbaijani states of the 15th century (Shirvanshahlar, Garagoyunlular and Aggoyunlular). The Safavid state (1501-1736) succeeded in establishing a centralised state in the 16th century. The Azerbaijani lands assumed strategic significance in the structure of Nadir shah’s (1736-1747) Empire. However, certain conditions (obstacles to forming a strong local power base etc.) did not allow Azerbaijani lands to break away when the Empire collapsed after Nadir shah’s death as a complete geographical and political entity. About twenty independent and semi-independent states, including khanates, were created on the territory of Azerbaijan. Then the stronger khanates (Urmiya, Guba and Karabakh) began a struggle to unite Azerbaijani lands. This was the situation when, at the end of the 18th and the beginning of the 19th centuries, the Russian Empire’s intervention in the South Caucasus disrupted the processes of natural and historical development. A struggle began between the Russian Empire and the Gajar’s state (1797-1925) for the khanates. 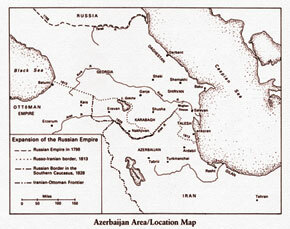 A division of Azerbaijani lands was carried out following the Russian and Iranian wars of 1804-1813 and 1826-1828. The Russian victories in both wars had an impact on the conclusion of the treaties. The Gulustan (situated in Karabagh) Treaty consisted of a preamble and eleven articles. In addition to the agreement there was a separate act allowing Iran to address Russia on border changes. Territorial matters were considered in the second and third articles. The borders between the parties were defined in the second article. By the third article, Iran accepted that the Ganja, Karabagh, Sheki, Shirvan, Derbend, Quba, Baku and Talysh khanates, Eastern Georgia and Dagestan belonged to Russia. By this article Iran also recognised the independence of the Azerbaijan khanates transferred to Russia. This fact has great significance from the juridical standpoint, in other words the occupied khanates had belonged neither to Russia nor to Iran before the occupation and had functioned as independent states. The fifth article of the Gulustan agreement is also important from the territorial point of view. Under this article the right to keep a Navy on the Caspian Sea belonged solely to Russia. This fifth article was, at the same time, directed against Britain. The Gulustan agreement did not resolve the issues between Russia and Iran. In 1826 a new war broke out between them. The war ended with the conclusion of a treaty in Turkmenchay village near Tabriz on 10 February 1828. Alongside the agreement, a special act on trade was also signed. By the second article of the Turkmenchay Treaty, the Gulustan agreement was superseded. Under the third article the transfer of the Irevan and Nakhchivan khanates of Azerbaijan to Russia was confirmed. The borders were defined in the fourth article. Iran accepted that all lands along the border line situated within the Caucasian chain and the Caspian Sea belonged to Russia. In accordance with the sixth article Russia received twenty million silver coins as compensation from Iran. The eighth article confirmed the fifth article of the Gulustan Treaty, re-stating the sole right of Russia to have a Navy on the Caspian Sea. Thus, under the Gulustan and Turkmenchay Treaties between Russia and Iran, Azerbaijani lands were divided. The Bolsheviks who assumed power after the October revolution of 1917 declared invalid the inequitable agreements concluded by the tsarist government. The Turkmenchay Treaty officially lost validity in February 1921 according to the eleventh article of the Moscow agreement signed between Soviet Russia and Iran. As in the Gulustan and Turkmenchay Treaties, the Soviet-Iran agreement of 1921 approved the division of Azerbaijani land. Following the division of Azerbaijan the geographical concepts North and South took on a political meaning. North Azerbaijan traversed a path from Russian colonisation to independence; however South Azerbaijan continues to exist within the structure of Iran. North Azerbaijan defeated the mighty colonial system of the Russian Empire, which had endured for more than one hundred years, and in May 1918 declared its independence as a state: the Azerbaijan Democratic Republic was established. The ADR was recognised de-facto by the world community in January 1920. However, in April of the same year the ADR collapsed as a result of occupation by Soviet Russia and sovietisation began: the Soviet Socialist Republic of Azerbaijan was established. The Soviet era continued until 1991. On 18 October 1991, the Constitutional Act of the State Independence of Azerbaijan was approved. South Azerbaijan has lived a different history within the structure of Iran. The idea of liberty, however, has also been the main theme of this history. South Azerbaijan was one of the main centres of the Iran revolution from 1905-1911 and played an important role in the adoption of the Constitution. The demand for autonomy arose for the first time in this period. From 1917-1920 the democratic movement expanded even further. A revolt led by Sheikh Mahammad Khiyabani was crowned with success on 7 April 1920. On 23 June the National Government was established. The governmental circles of Iran overthrew the National Government on 14 September and Khiyabani was killed. The Pahlavis accession to power (1925-1979) extended policies which discriminated against South Azerbaijan. In spite of this, it remained one of the centres of the liberation movement. During World War II, the democratic movement in South Azerbaijan flourished again. In December 1945 the Democratic Government of Azerbaijan was established, but this government also collapsed within a year, in December 1946. South Azerbaijan also played an active role in the revolution of 1978-1979, which resulted in the overthrow of the Pahlavis’ regime. However, the expected democratic changes were not implemented. South Azerbaijan could not separate as a united geographical territory from the structure of Iran and, instead, the policy of dividing it into different administrative and territorial units was continued. Notwithstanding the division of Azerbaijani lands and the status of its North and South parts at different periods of history, relations between the two Azerbaijans, especially between their populations, have continued. As a result of the adoption of interstate agreements (the convention of 1844 etc.) and legislative documents providing convenient movement across the Iranian border during the Russian Empire, many people from the South lived in North (Russian) Azerbaijan. In the early 20th century their number exceeded half a million. After the establishment of Soviet power in Azerbaijan, for a certain period relations between the Azerbaijans were laid low. It is well-known that the USSR, into which Azerbaijan had been included, gradually became a “barrack-like state”. During the 1930s, repression assumed a grand scale. In those conditions most residents of the South living in the Azerbaijan SSR were deported from the country. In August 1941, the entry of the Soviet Army into Iran (South Azerbaijan), brought relations between the Azerbaijans, especially during the Democratic Government of Azerbaijan, to their highest level. However, conditions did not allow the idea of uniting Azerbaijan to be realised then. In December 1946, after the collapse of the Democratic Government of Azerbaijan, thousands of South Azerbaijanis migrated to the Azerbaijan SSR. From the end of the 1980s, crossing the border between the Soviet Union and Iran was made relatively easier and relations between the two Azerbaijans were again broadened. In December 1989 the fences on the borders with Iran were destroyed as obstacles between the two Azerbaijans, by people living in the border regions of Soviet Azerbaijan. Relations between the populations of the Azerbaijans, as a living connection, have provided continuity and an enrichment of the material and spiritual advances achieved by the nation historically. … There are many examples of divided nations, lands and countries in world history (Poland, Germany, Vietnam, Korea etc.). It is also possible to make comparisons and find similarities with Azerbaijan. However, the specific features of Azerbaijan (the existence of an independent state in the North, the division of the territory and population into different administrative units in the South etc.) are most significant. It is difficult to adopt an unambiguous approach to this question. There must be a distinction between political, scientific and social points of view. We have endeavoured to adopt a purely scientific approach.